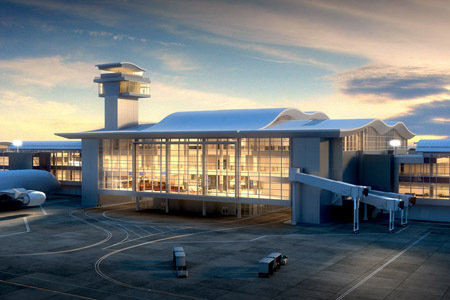 Los Angeles International Airport (LAX) will get an international concourse expansion, expected to be completed in 2020. The Tom Bradley International Terminal (TBIT) at the Los Angeles International Airport (LAX) will be getting a concourse expansion. The Midfield Satellite Concourse (MSC) North is a five-level, 69,677-m2 (750,000-sf) expansion that will be accessible via a 111-m2 (1200-ft) long tunnel corridor with moving walkways. With 12 new gates, aircraft parking aprons, and taxiways, the new concourse is expected to improve operations, enable faster connections, and ease passenger access. Corgan is the project’s lead architecture firm. Gensler and CannonDesign are also working on the design-build project. Turner Construction Company and PCL Construction Services, Inc. are managing it. Atlas Roofing provided the roof and wall insulation assemblies for the project. Construction that started in February 2017 is expected to wrap up in 2020. The project had to meet the California Green Building Standards Code (CALGreen) Mandatory and Tier 1 requirements. In addition to attaining CALGreen’s Tier 1 requirement, the build and design teams are aiming for a Leadership in Energy and Environmental Design (LEED) Silver certification.